A dynorphin-A analog can be used for treatment, inhibition, and/or prevention of cocaine seeking behavior, and or the drug seeking behavior for a cocaine derivative or other structurally related substance. The dynorphin-A analog can be a cyclic dynorphin-A analog having sufficient systemic stability that crosses the blood-brain barrier so as to be active in the brain at kappa-opioid receptors (KOR) as an antagonist. Such activity at a KOR as an antagonist can be useful for cocaine management and reducing the desire, such as stress-related desires, for use of cocaine, crack, or the like. 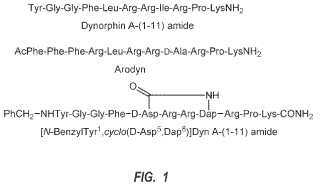 The KOR antagonist can be [N- benzylTyr1, cyclo(D-Asp5, Dap8)]Dyn A-(1-11) amide, salt thereof, prodrug thereof, and/or derivative thereof.